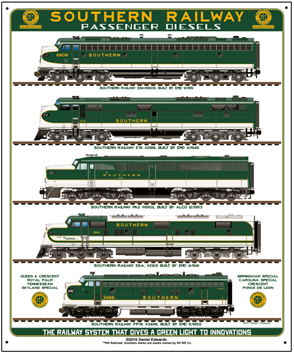 Operated premier passenger trains such as the Crescent, the Southerner, the Tennessean and others. Ran steam excursions for many years. Now part of the Norfolk Southern System. 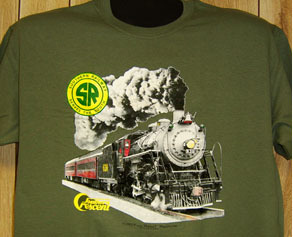 Tee features the Southern Railroads beautiful #630 steam locomotive. Number 630 has been restored and is in operation at the Tennessee Valley Railroad Museum in Chattanooga, TN. Feel the heat... smell the smoke. 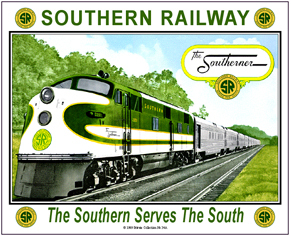 Presenting the Southern Railroads famous logo followed by the equally famous Southern Crescent logo. This is a t-shirt all Southern railfans will appreciate. Ash tee with bright Green and yellow colors. 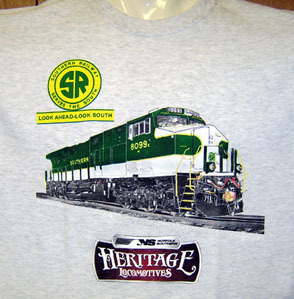 Southern Railway Heritage tee shirt in classic Southern green and white. Part of the Norfolk Southern Railroads Heritage fleet. Coffee Mug featuring the newly rebuilt Southern Railway steam #4501. Preserved at the Tennessee Valley Railroad Museum in Chattanooga, TN. Coffee Mug featuring the newly restored Southern Railway steam #630 as preserved at the Tennessee Valley Railroad Museum in Chattanooga, TN. Coffee Mug Southern 6900 E restored and operational at Spencer Historic Shops. 11 ounce coffee mug featuring the Southern Railways beautiful E-unit number 6913 in black white and gold color scheme. Coffee Mug featuring the newest SOUTHERN widebody diesel in the Norfolk Southern Railroads Heritage Fleet. License Plate with the classic Southern Railway logo surrounded by several tag lines. Mouse pad honoring the Southern Railroads famous No. 4501 steam locomotive as restored by the Tennessee Valley Railway Museum in Chattanooga. A beautiful engine. 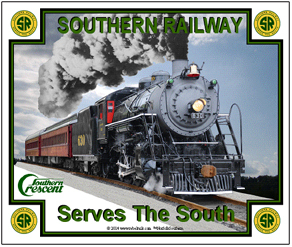 Mouse pad honoring the Southern Railroad famous No. 630 steam locomotive as restored by the Tennessee Valley Railway Museum in Chattanooga. A beautiful engine. 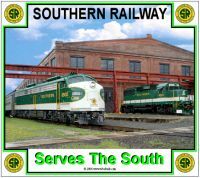 Mouse pad honoring the new Southern Railway Heritage diesel operated by the Norfolk Southern Railroad. 6 inch x 6 inch square tin Crescent logo of the Southern Railroad. 6 inch x 6 inch square tin dark green logo sign of the Southern Railroad. 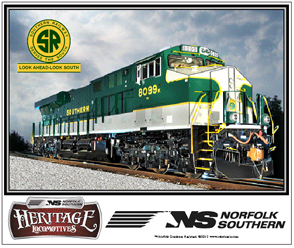 Southern diesel joins Norfolk Southern Railroads Historic diesel fleet. 6 inch x 6 inch square tin sign of the historic Southern Heritage diesel. A powerful locomotive paint scheme. 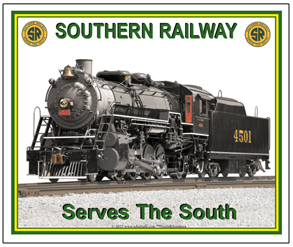 6 inch x 6 inch square tin Southern Railway logo sign of the Southern Railway. 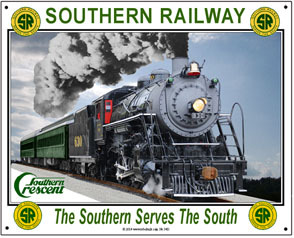 This logo said Southern Railway across the top of the emblem. 6 inch x 6 inch square tin The Southern logo sign of the Southern Railway. This logo said The Southern across the top of the emblem. Tin Sign featuring the Southern Railways famous No. 630 steam locomotive recently restored and operating at the Tennessee Valley Railroad Museum in Chattanooga, TN. 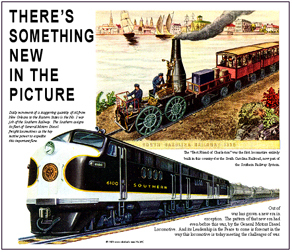 Tin Sign Southern FT Diesel ad promoting the new EMC freight diesel. A familiar sign found in just about all railroad stations in times gone by. Very nostalgic and comical if used in the right setting. 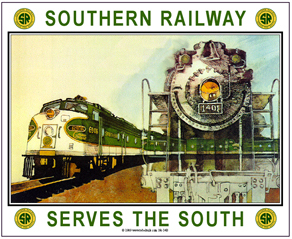 Southern Railway diesels are presented on this metal sign in beautiful Southern Green, white with yellow gold trim. Examples of E-units, PA and F diesels.